This fun, fresh ans washable fabric bag not only reduce daily waste across our planet. 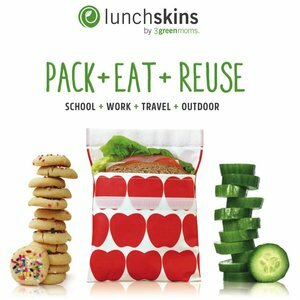 These trendy looking Lunchskins sandwich bags replace hundreds of plastic sandwich bags. They are handy to carry snacks and sandwiches around, but you can also use them, for example, for cosmetics, dog treats and crayons. The cotton bag has a waterproof food safe coating on the inside. Lunchskins are of a convenient size and have a strong Velcro closing. The paint used on the cotton fabric is 100% lead free. In addition, the??Lunchskin? ?is, very importantly, free off BPA and phthalates!